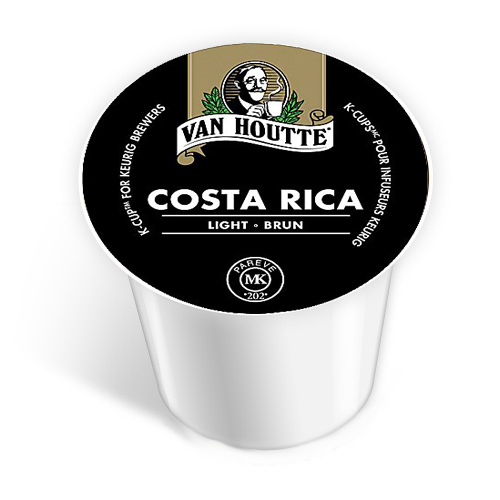 Van Houtte’s Costa Rica light roast blend in a Keurig K-Cup is a nice, mild coffee with a subtly sweet after taste. Like the tropical nation this coffee gets its name from, there’s something warmly inviting about the quiet hues of honey, chocolate, and coffee found in each cup. If you like your coffee on the stronger side, consider brewing a smaller sized cup. If you prefer your coffee on the lighter side, then just brew your regular dosage. Either way, chances are you’ll be charmed by the exotic nature of this Costa Rica blend. I normally prefer stronger, bolder blends, but Costa Rica is a great coffee for those days when I need something delicious but a little less intense.